South Africa is falling behind in terms of global competitiveness and food security, but there is still cause for optimism. This was the opinion of Dr John Purchase, the Chief Executive of the Agricultural Business Chamber, who outlined the elements of a plan presented to the president of South Africa, for ensuring food security for this country. 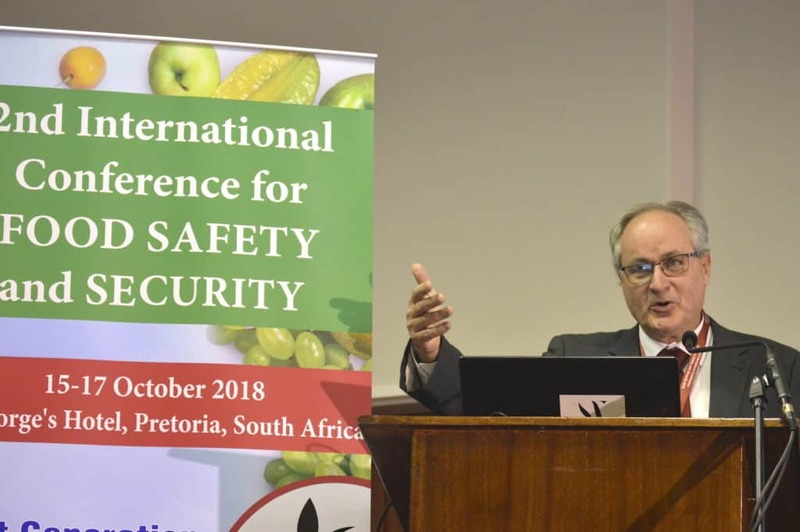 He was speaking at the 2nd International Conference for Food Safety and Security in Pretoria today (Monday 15 October). To assess how South Africa is performing in line with this definition, he referred to the country’s rankings on the Global Food Security Index, which consider performance in four areas: food availability, food affordability and food quality and safety, all of which must be sustained by stability over time. “Only when you are achieving in all four spheres are you hitting the sweet spot in the middle that means you have a sense of food security,” he said. However, he pointed out that while South Africa ranks quite well in terms of national food security at 44thplace globally, household food security is a big problem. “In South Africa, 70% of households are food insecure, based on high unemployment,” he said. This highlights that food security is not just an agricultural matter, but rather is bound up in all the macroeconomic factors at play within a nation. Based on the Global Competitiveness Report 2017, South Africa was ranked 61stin the world, down from 47thin 2016. Not much improvement is expected in the upcoming 2018 ranking. “That’s not good enough. We have to sharpen up. Our average growth over a ten-year period is 1.7%, which is below the population growth, so that actually means we are going backwards. Our official unemployment rate is 27%. And our GDP in US dollars has dropped more than 25% since 2011. We are not progressing well,” Purchase said. However, he added that there’s been a slight increase in 2018, which is cause for some hope. He pointed out that South Africa, which has the most unequal society in the world, has to improve the quality of its society to improve its competitiveness. We currently rank 125thout of 140 countries in terms of health and 84thout of 140 in terms of education. If South Africa can get these issues right, they will make a significant contribution to our competitiveness, which Dr Purchase defined as “the ability of an industry/firm/sector to attract investment and other scarce resources by trading products in the global marketplace, whilst continuously striving to earn at least the opportunity cost of resources engaged”. The country’s agricultural competitiveness has regressed, but there has been a concerted effort to improve that, with some areas presenting significant global opportunity. Poultry is the biggest food industry in South Africa as the nation’s main source of protein. Beef is also pretty big, as is yellow maize. There’s also strong growth in soy. However, he added that there was declining competitiveness in wheat, groundnuts, sugarcane and white maize. Policy certainty, an enabling regulatory environment, government service delivery and registration, especially as relates to land, water, demand-side management and ensuring transparent and credible local markets. Smallholder and developing farmer support for commercialisation. He said that if the regulatory framework is improved, then agriculture can create an extra one million jobs in South Africa, but a proper public-private partnership structure is necessary. The conference is jointly hosted by the University of Pretoria; DST-NRF Centre of Excellence in Food Security, University of Johannesburg, Human Sciences Research Council, and the Agricultural Research Council in South Africa.